Car buyers with a creative streak now have the perfect canvas on which to bring their visions to life. 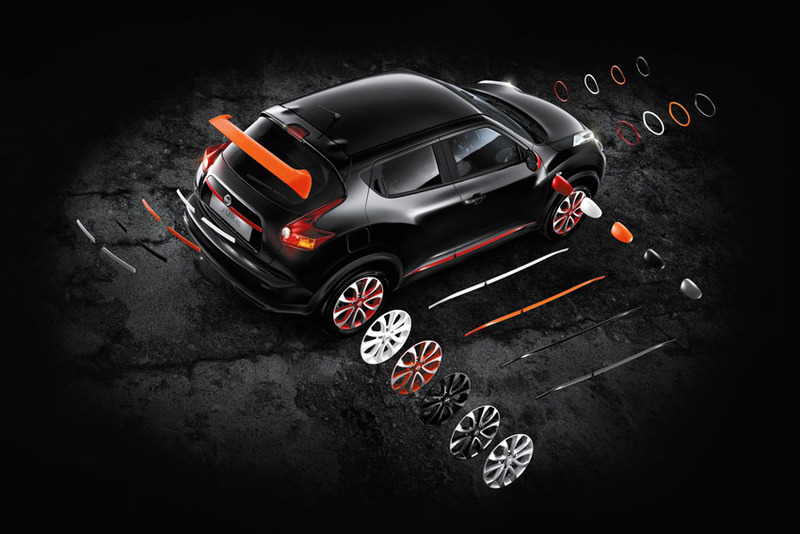 Following its successful launch in 2012, Nissan is further expanding its innovative personalisation programme for Juke. styling and design elements are now customisable and available in up to eight different colours and shades. The majority of the components, including 17-inch alloy wheels, roof spoiler, side sills and headlamp finishers are available in all eight available colours. This opens up an exciting world of possibilities for buyers. To mark the expansion of the personalisation programme, three new trim colours will be added in the coming months - electric blue, mat black and black purple, along with a new design of 18-inch alloy wheel that can specified in silver, black and diamond cut metallic grey finishes. The expanded personalisation programme also includes a number of new cabin features. Four different areas can now be customised with the same colour palette as the exterior. The centre console, for example, can be specified in one of seven different colours or finishes, along with the door finishers. The tweeters and air vents are available with eight different options, while even the floor mats now come with optional colour stitching. To help buyers visualise their tailor-made Juke before ordering, Nissan has created a new 3D configurator that allows users to see how each new element looks. Developed specially for Nissan, the powerful visualisation module allows users to rotate a high-resolution, photographic-quality version of their Juke through any angle. Buyers can add and remove trim and wheel designs and switch between the eight body colours at the click of a mouse button. Once complete, users are given a unique personalisation code that allows them to access the design via the Nissan homepage. Buyers who wish to order the car can then take the code to a Nissan dealership, where their design can be accessed and ordered. "Juke customers have always had an eye for bold, stylish design, and with the new personalisation programme, they have the potential to create a truly unique car," said Bastien Schupp, Marketing Vice-President for Nissan in Europe. "The possibilities are now almost infinite, and we're really looking forward to seeing what exciting new looks our customers create with the new configurator. It gives Juke an even more powerful presence in the crossover sector, and further reinforces Nissan's drive to offer customers something extra."